It's midnight on the nose. The power is out, and an eerie green light from the moon filters through the windows of a high school dormitory. A lone teenage boy stands at the entrance, watching a girl emerge from the side hallway. Her voice quavers as she asks, "Who's there?" The boy's eyes are drawn to a holster on the girl's hip. Still trembling, she reaches for her sidearm, nearly drawing the weapon, when another student appears behind her and commands her to stop. "Why do you have a gun?" So asks your character in the opening of Shin Megami Tensei: Persona 3. It turns out the question is more poignant than one might expect. Case in point: One of the basic tenets of the game is that in order to fight Shadows, monsters that plague the minds of humans and essentially turn them into vegetables, you must summon Personas, spirits manifested from your character's psyche. To do so, you put a gun-like device, called an Evoker, to your head and pull the trigger. Fans of Persona 3 (or P3 for short) know that it's not a real gun, of course, but to the casual observer, the imagery is unmistakable. Far less offensive symbolism has captured the attention of the national media - a fate which P3 largely escaped. The question is, then - why take the risk? What possessed the developers of Persona 3 to use such imagery? Surely there must be a deeper reason than to attract attention and boost sales. Indeed, it may have actually limited its appeal. I have to admit I was one of those people who initially took offense. Without delving too deep into my medical history, I've found myself in a similar situation before. It's not fun, nor is it a scenario that one would think could become a compelling gameplay mechanic. 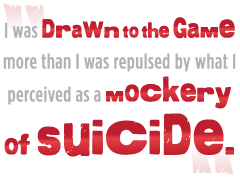 Still, I was drawn to the game more than I was repulsed by what I perceived as a mockery of suicide. I'm glad I gave it a chance. I found out the true purpose of characters holding guns to their heads - to induce the emotional stress necessary to summon a Persona. Instead of belittling those with depression, I saw it as a possible reversal of what the imagery typically signifies. Instead of self-destruction, it's self-protection, and it could be a message to encourage those who have such thoughts to turn them around and get help, to make something positive of them.